At RHRLI, we talk a lot about the ARTAS® hair restoration procedure. We’re the only hair treatment center on Long Island that uses the ARTAS® system, a state-of-the-art hair transplant system that uses cutting edge robotic technology. We feel it is the best treatment option out there for those seeking a permanent solution to hair loss or thinning hair. 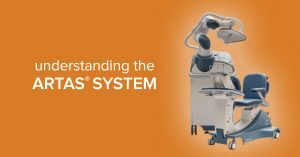 But we understand that you might have some questions about how the ARTAS® system works. So we’d like to give you a look at the entire process. RHRLI wants you to understand how the ARTAS® system operates and how it differs from other hair transplant procedures out there. We want to show you why ARTAS® can set you on the road to a healthier head of hair. Your introduction to the ARTAS® system begins with a free consultation with your doctor, Baiju Gohil, MD. Dr. Gohil has more than a decade’s worth of experience and he meets with each patient that comes in to see him. He also takes part in every procedure performed at RHRLI. Before your hair restoration treatment, you’ll also undergo a thorough scalp examination to make certain that you have enough available healthy donor hairs to warrant doing the treatment. After that, your doctor will design a new hairline for you and also determine where to place your grafts. Grafts are minuscule groupings of hair harvested from the donor area of the scalp. The transplant process will be performed using ARTAS®. ARTAS® is a Robotic Follicular Unit Extraction (RFUE) procedure which means that it’s a minimally invasive procedure. Unlike other procedures like Follicular Unit Transplantation, also known as strip surgery, RFUE doesn’t require surgical incisions or stitches. Most patients are back to normal, everyday activities within days of having the procedure. The ARTAS® system is the most accurate hair restoration treatment available. Your doctor will determine which hairs are most suitable for transplant. Then the hairs will be harvested, using the ARTAS® system’s robotic arm. The precision of ARTAS® allows donor hairs to be selected in a way that leaves the donor area to remain natural looking. Then it’s time to transfer hair to where they’re needed. Your transplant will be performed with precision and accuracy because of the robotic technology. This shows the difference between RFUE and other Follicular Unit Extraction (FUE) techniques which involve handheld devices. The ARTAS® system will leave you with a more natural looking head of hair. Once the procedure is over, your doctor will give you instructions on how to take care of your transplant area. Most patients are able to sleep comfortably following the procedure. Your newly transplanted hair will grow steadily over time and you should notice significant growth in about six months. We hope this gives you a better understanding of the ARTAS® hair restoration procedure and how it differs from other types of hair transplant that you may have heard about. If you’re looking for a permanent solution to hair loss, that’s minimally invasive and has the precision needed to give you a natural looking head of hair then the ARTAS® system is right for you. To get started, contact RHRLI today. Previous Post: « What is Trichotillomania?